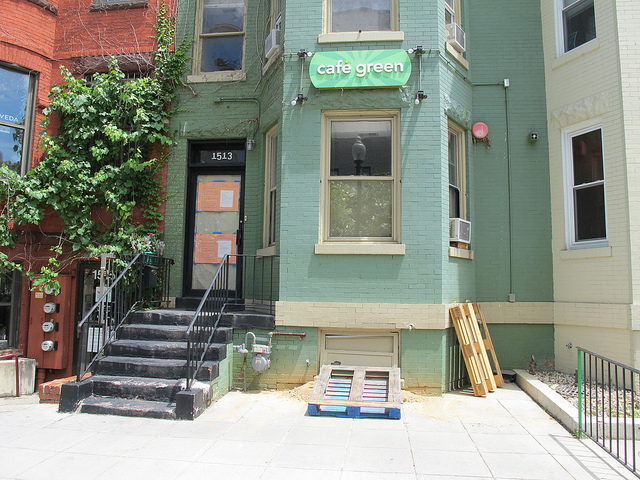 Last week we learned about the new “East London Style Cafe” coming to former Cafe Green space in Dupont. Bringing East London to East Dupont! Duke’s Grocery is a casual market, cafe & pub serving seasonally driven eats & good drinks. We are excited to be part of the 17th Street / Dupont community! Come join us early for freshly brewed coffee and espresso, house-made pastries & cakes. If you’re really hungry, grab a proper English Breakfast with our homemade banger sausages and black pudding. The front patio is perfect for a coffee and newspaper before work. Looking for something on the lighter side? We have a full menu of hand squeezed juices, beigels (like they make them back on Brick Lane) and small breakfast plates. Cruise on by at lunch and grab one of our delicious sarnies from our ever changing lunch menu. All of our meats, soups, and charcuterie are hand-made. If you’re in a rush, no worries! Just give us a call and we will deliver to your office. If a relaxing place to work is what you are looking for, then snag a bite and a coffee and head upstairs for free Wi-Fi and a quiet place to do work or lay back. For dinner, grab a cold beer, cocktail or a glass of wine and join us upstairs for seasonally driven starters and dinner plates. In true London fashion, we have a variety of house-made curries, pastas, meat and seafood plates. Our menu is always changing, and our dishes are prepared depending on what’s fresh that day. Check out the blackboard for daily specials. Cocktails served late. Long day at the office? No worries. Duke’s has business catering! Leave the work to us. Call in your order or set up a delivery schedule and we will happily deliver. The grocery table will feature a selection of fresh produce from selected local farmers. No need to wait until the weekend for the farmers market to get your fresh fruits and vegetables.